This is the fourth year of running Winter Wellness and Inclusion Cornwall is a lead partner. Helping 47 to stay in work and 35 progressing to work. 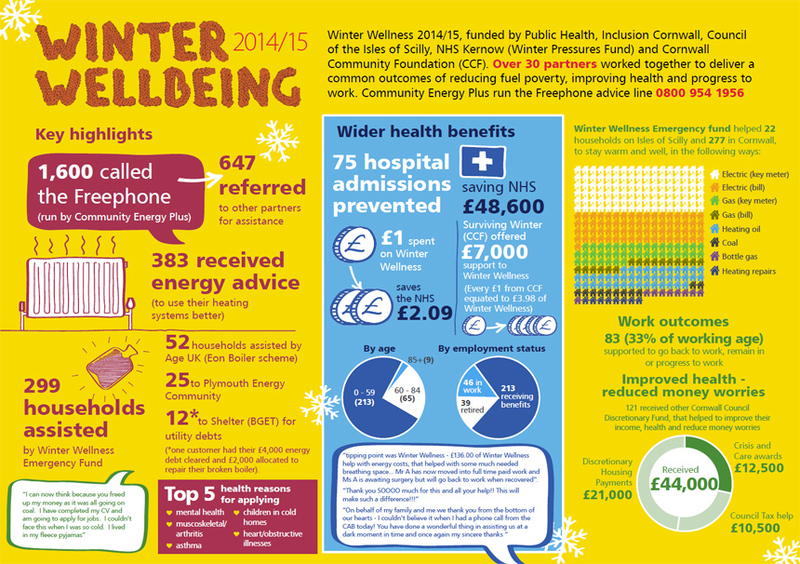 Winter Wellness is funded by Public Health, Inclusion Cornwall, Council of the Isles of Scilly, NHS Kernow and Cornwall Community Foundation (CCF). Over 30 partners worked together to deliver a common outcomes of reducing fuel poverty, improving health and progress to work. Our top tips for staying warm and well this winter has useful advice and information about staying warm, keeping well and being happy and safe this winter. Winter wellbeing guides to staying warm are available from Council One Stop Shops, NHS hospitals and surgeries, libraries and many other sources. Please see the Winter Wellness Process that outlines how we work. helped nearly 200 households remain in work and progress towards work. 52 households assisted by Age UK (Eon Boiler scheme), 34 to Plymouth Energy Community and 10 to Shelter (British Gas Energy Trust) for energy debts. Winter Wellness, helped 121 (40% of Emergency Fund) customers to receive Crisis and Care, Council Tax help and Discretionary Housing Payments, improving their income and helping to reduce their money worries.